The motto of FamilyFarmed‘s Good Food Business Accelerator is “Getting Good Food Businesses Ready for Prime Time,” and its goal is to help each year’s nine food and farm entrepreneurs — competitively selected for intensive training — to establish their businesses, scale up and succeed. So we at FamilyFarmed were thrilled when The Chicago Tribune published an article about Jenny Yang — a graduate from the first (2014-15) cohort of the Accelerator program — and the planned $1.7 million expansion of her fast-growing Phoenix Tofu company. 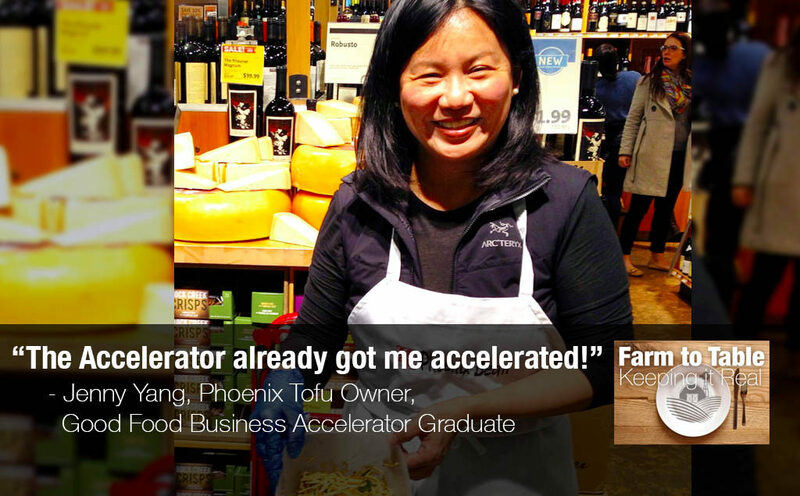 Jenny Yang of fast-growing Phoenix Tofu was a member of the first group of Fellows participating in FamilyFarmed’s Good Food Business Accelerator. 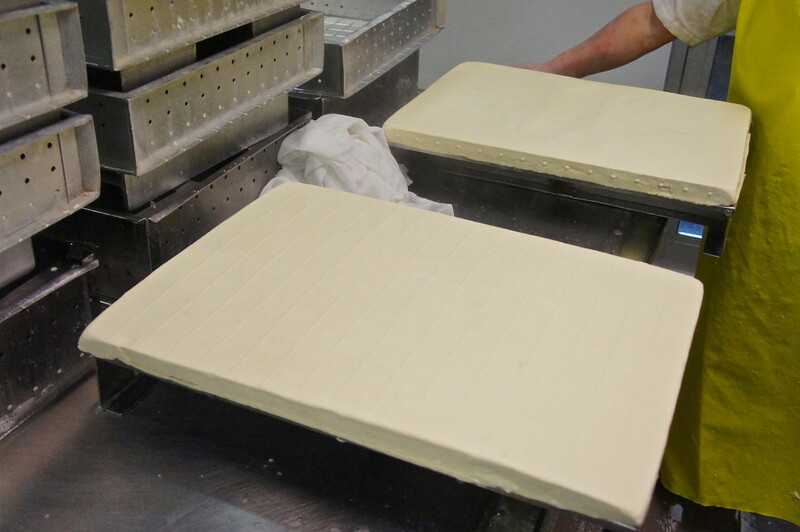 Yang’s uniquely delicious tofu, produced from organic Illinois soybeans, is a hit with restaurant chefs and consumers, who first became acquainted with Yang’s products at Chicago-area farmers markets and now can find them at all of Whole Foods Market‘s Midwest region stores, among other retailers. Yang’s expansion, needed to meet this rising demand, includes a 10,000 square foot production facility that has five times the space as her current factory nearby on Chicago’s North Side. 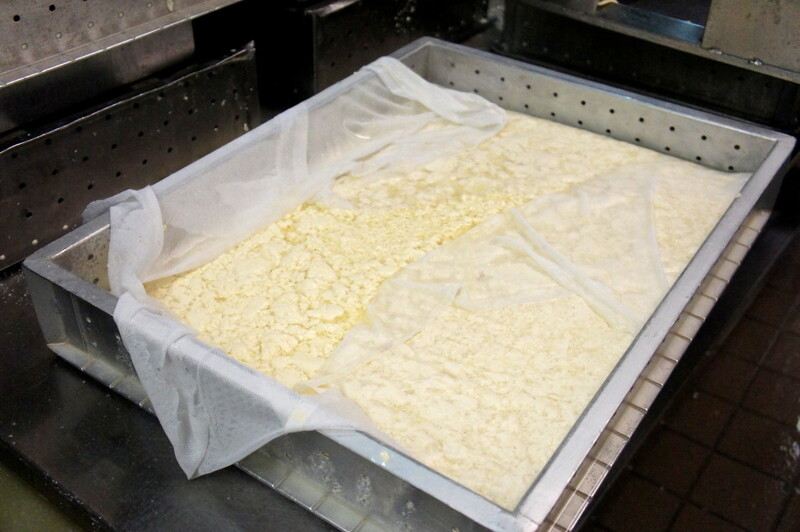 To supplement the Chicago Tribune story linked above, we are re-publishing an article we posted on Good Food on Every Table in February 2015 about Yang’s journey from Taiwan immigrant to major tofu maker and the benefits she accrued by participating in the Good Food Business Accelerator. 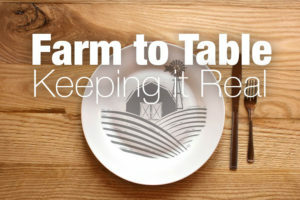 We have also included this piece in our Farm to Table: Keeping It Real series because of her work with restaurants seeking locally and sustainably produced ingredients. Previous articles in this series can be found on the Good Food on Every Table home page. The stories of immigrants achieving success by making the foods of their native lands are parts of the history and social fabric of the United States. Jenny Yang — whose Phoenix Tofu products, marketed under the Phoenix Bean label, are gaining a strong following in her hometown of Chicago and its region — is following that well-traveled path. Yang — one of the first nine Fellows who participated in FamilyFarmed‘s Good Food Business Accelerator program — says her decision to make this change had two major influences. It helps that Yang was able to find a farmer in Marengo — located in north-central Illinois just beyond Chicago’s exurbs, about 60 miles from Phoenix Bean — growing soybeans using organic methods. [Editor’s Note: Since the article’s first publication, Yang and Phoenix Tofu have been obtaining soybeans from Harold Wilken at Janie’s Farm in central Illinois.] The fact that Phoenix Tofu’s beans are non-GMO and produced without chemicals or pesticides has boosted the appeal of its products within the fast-growing market of Good Food consumers. Her associations with FamilyFarmed, as an exhibitor at its Good Food Festival and Trade Show, a finalist in its 2014 Financing Fair, and as a founding Fellow in its Good Food Business Accelerator program, have helped Phoenix Bean take its next big step up. 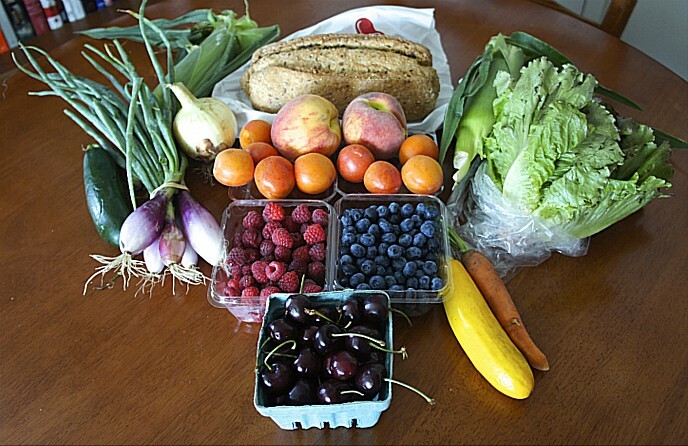 Its products are now widely available in the Whole Foods Market chain, which has a long working relationship with FamilyFarmed. Her tofu is on the menus of many of the city’s Asian restaurants, and her products — which include fresh tofu of a variety of firmness, delicious tofu-based salads, and fried tofu — have found a place on the shelves of a number of retail outlets. “The Accelerator already got me accelerated,” Yang said. “Whole Foods, we had contact back and forth for a while. But in January , I was talking to Stefanie Garcia, and she said, ‘Jenny, you’re already in the system, you can come in any time.” Garcia, then in her role as “local forager” for Whole Foods’ Midwest region, helped local businesses get their products into the chain’s stores. 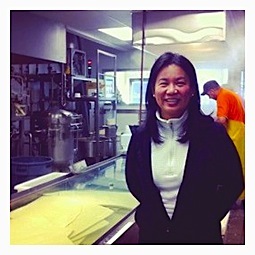 Lydia Miller of Dana Investment Advisers was Yang’s “supermentor” in the Good Food Business Accelerator program. “Jenny is wonderful to work with as a mentee. She has a very strong work ethic. She is balanced — both confident in her abilities while open to suggestions on how to best position her company and capitalize on the opportunities ahead,” Miller said. It helps that Yang, who has done many of product samplings herself since going into the business, has a winning personality. You may run into her at one of those Whole Foods stores, at farmers markets, or somewhere else around Chicago. 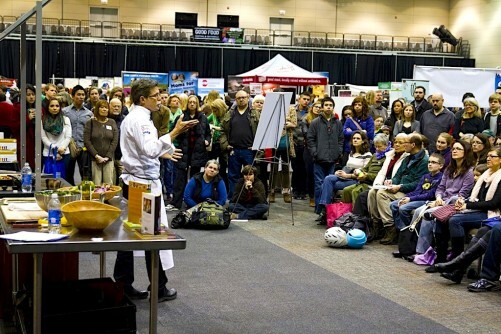 This entry was posted in Farm to Table: Keeping It Real, Farmers markets, Food and health, Food Artisans, Food Entrepreneurs, Good Food Business Accelerator, Good Food business development, Good Food Festivals, Good Food Financing Fair, Good Food marketing, Good Food Success Stories, Organic farming, Sustainable food retailing, Whole Foods Market and tagged Chicago Tribune, Door to Door Organics, FamilyFarmed, Farm to Table: Keeping It Real, food artisans, Food Entrepreneurs, Good Food Business Accelerator, Good Food Festival & Conference, Good Food festivals, Good Food Financing &Innovation Conference, Good Food movement, Green City Market, Janie's Farm (IL), Jenny Yang, local food, local foods, Logan Square Farmers Market, Natural Direct, organic farming, Phoenix Bean tofu, sustainable food, sustainable food retailing, Whole Foods Market. Bookmark the permalink.